The most recent stethoscope software solution is a simplified version of the FDA approved sSOIP Auscultation Anywhere software. 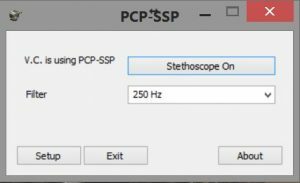 This new software version is called PCP-SSP and works with RNK’s flagship PCP-USB stethoscope. (For software compatible with PCP-1 mic port stethoscopes, see sSOIP Auscultation Anywhere software below). PCP-SSP installs a Microsoft approved driver which integrates into the audio channel of the users desktop video conference platform. As a result, the software only needs to be installed on the patient side and the physician simply listens with a headset while in the video call. In July 2018, RNK Products, Inc. announced a Chrome compatible “application programmers interface” (API) for its PCP-SSP stethoscope signal processing software. This new API will enable telehealth/telemedicine providers to easily integrate the FDA cleared stethoscope signal processing software into their own platform. After many years of research and development, RNK Products developed an industry changing telemedicine software product called sSOIP Auscultation Anywhere. This advanced telemedicine software was designed specifically to work alongside our PCP-USB and PCP-1 (mic port) stethoscopes via Windows® based PC’s, Laptops and tablets. 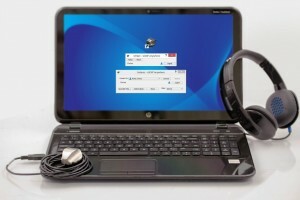 The software requires minimal bandwidth, so special PCs and Internet connections are not required. The innovative software, along with the stethoscope chestpiece, are Food and Drug Administration approved as a total auscultation system to pick up and transmit sound anywhere over the internet. This system of hardware and software is classified as a Class II Medical Device by the FDA. The sSOIP Auscultation Anywhere software works with devices running full versions of Windows® operating systems and that have standard broadband internet connections. The software transports auscultation sounds, either live or recorded, from the USB stethoscope to remote clinicians. This version of the software utilizes a cloud based server for facilitation of direct peer-to-peer transmission of the audio stream between the clinician and patient sites. The software installs on both the physician and patient site computers and requires Windows OS on both ends of the call. With this software, clinicians and physicians can use our PCP stethoscopes to examine patients remotely and listen to the heart, lungs, peripheral arteries, and even the abdomen. By providing the tools necessary to create over-the-internet, peer-to-peer connections, physicians can build and enhance strong, personal connections with their patient populations.